Four years ago, IDC issued a prediction--disguised as fact--that claimed Windows Phone would eclipse Apple's iPhone by 2015. While laughable in hindsight, IDC now says Microsoft's Surface sales will improve at the expense of iPads, offering an even less plausible explanation for why this could happen. IDC is a research firm that Microsoft regularly commissions to write flattering white papers about itself, so it's not particularly surprising that the group would regularly generate "data" that paints the future of one of its best clients in rosy hues. What's more surprising--and disturbing--is that many legitimate-appearing media sources continue to broadcast IDC's prognosticating "research" as factual when it so consistently wrong. IDC does share some useful data, but its figures are often couched in analysis that flies in the face of reality. At the same time, IDC has completely failed to predict some of the most commercially relevant and important shifts in the technology sector, and actually appears to have intentionally worked to obfuscate clear trends by creatively downplaying pivotal events as they occured. First, examine the reality facing Microsoft's Surface. There's been a lot of reports talking about how well Surface Pro is performing as a new product category. That's particularly noteworthy because it is factually inaccurate. Over the last three years of Surface sales, the product does not appear to have ever sold more than a million units per quarter (based on revenue). Microsoft wrote off nearly a billion dollars in losses within its first year of disastrous Surface sales, which included both the ARM-based Surface RT and an Intel-based Surface Pro. Microsoft had spent two years porting its legacy Windows software to ARM processors in an effort to develop the $499 Surface RT as a suitable challenger to Apple's iPad. However, after it bombed as a product, the company abandoned Surface RT and has doubled down on its much more expensive Intel-based Pro models, shifting its focus from iPad to Apple's Macbook Pro notebook line. While Surface is now regularly bathed in praise from the same sources who applauded Microsoft's Zune in 2009 and Windows Phone 7 in 2012, there is no factual support for predicting that Surface sales are gaining significant traction. Instead, Microsoft itself just reported that its Surface revenues for the most recent September quarter fell by 24.3 percent sequentially (compared to the previous quarter), or 25.99 percent over the year-ago quarter. Compare that to the first three years of sales for Apple's iPad--which like Microsoft's Surface, was Apple's first attempt at building a differentiated, more mobile alternative to conventional notebook PCs. Apple reported immediate profitability and launched with sales of more than 2 million units per quarter, about twice the quarterly volume reached by Surface at its peak. Across its first three years, iPad reached sales volumes of 10 to 20 million units ($6 to $10 billion in revenue) per quarter. Surface might generate $3 billion in revenue this year. Those sales volumes not only vaulted Apple into the position of being the world's largest computer maker, but also had an immediate impact on conventional PC sales, in addition to creating massive ripples that interrupted component demand for the mechanical hard drives and RAM used by conventional PCs. It also helped derail Microsoft's PC licensing business, which still hasn't recovered. This low-end disruption was well underway by the end of 2011, after just two years of iPad sales. Apple was selling more iPads than all the PCs that HP or Dell were producing--then the two largest PC makers in the world. However, even as Apple was selling more and more tablets, it was also selling more and more conventional Macs and more and more smartphones. Microsoft has no real PC hardware business of its own (although it been sharply affected by the marked decrease in PC licensing); it also has had no success in establishing a Windows Phone business, despite having been in the smartphone market longer than Apple. That means Microsoft is entirely dependent upon its Surface line to deliver any glimmer of hope from hardware sales to replace its sharply lower Windows licensing and make up for the fact that its entire business in smartphones has been a complete failure of epic proportions. Microsoft desperately needs good news for its Surface. Unfortunately, there's no legitimate good news to glean from any comparison iPad and Surface sales over the most recent September quarter. Despite the fact that Apple's iPad unit sales reached their lowest point in three years--down by 5.7 percent sequentially and 19.56 percent over the year ago quarter--Apple still sold 9.88 million iPads in the quarter, while Microsoft moved well under a million Surface computers. Microsoft's revenues from Surface declined by a larger proportion vs. Apple's iPad, and those Surface sales were far smaller in number. IDC chose the year 2019, and charted out a fantasy scenario where Apple's "tablet market share" gently, incrementally falls down to 25.7 percent across the next four years while Microsoft's share rapidly grows from single digits to 17.8 percent. Android tablets, IDC, imagines, will plummet from 67.3 percent to 56.5 percent. The logic used to support this fantasy scenario is that buyers are shifting from tablets to tablet-laptops. Jean Philippe Bouchard, an IDC tablet analyst, claimed that "we're witnessing a real market transition as end users shift their demand towards detachables and more broadly towards a productivity-based value proposition." Despite this explanation, IDC inexplicably presented (above) its futurist figures in a way that combines larger tablets like the 12.9 inch iPad Pro and 12.3 inch Surface Pro 4 with Apple's existing 9.7 inch iPad into a "medium sized" tablet category, obscuring its purported point entirely. A second IDC analyst, Jitesh Ubrani, succinctly highlighted a raison d'être for the firm's forward-looking press release in four words: "the growth of Windows." That was a "key trend" that IDC's "transition to detachable tablets ushers in," with another being a "turnaround for Apple's iPad device line." And by "turnaround," IDC means a roughly ten percent loss in market share for iOS. "Detachables" is a new market segment invented by IDC to describe "2-in-one" devices, which are products that look like a Surface. For companies and journalists commissioned to publish optimistic news about Microsoft, the idea of attaching a tablet to a keyboard to create a notebook-like computing experience was invented by Microsoft in 2012. The idea that Microsoft "invented" the concept of pairing a tablet with a keyboard, and that everyone else is now "copying" Microsoft has reached a bizarre level of blind fanaticism. This isn't remotely true, as Apple's iPad was offered with a keyboard from the beginning. Mainstream tablets have had attachable keyboards since at least the Newton Message Pad back in 1993. That really doesn't really matter today. 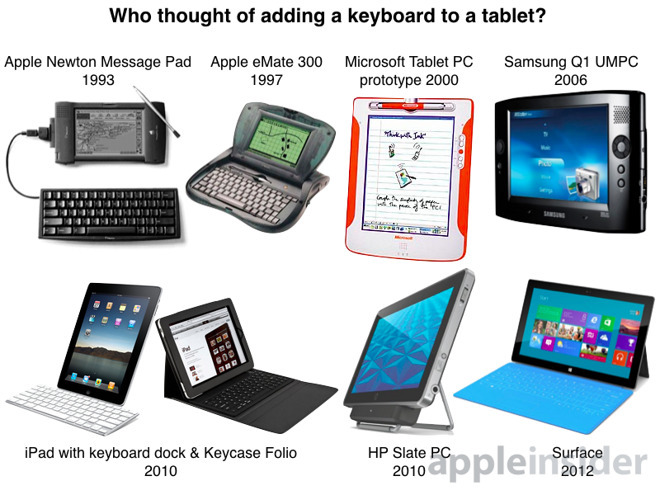 However, the idea that Microsoft "invented" the concept of pairing a tablet with a keyboard, and that everyone else is now "copying" Microsoft has reached a bizarre level of blind fanaticism. Patrick Seitz, a contributor to Investor's Business Daily, offered an example of this historical revisionism in recently claiming, "Microsoft has led the shift from stand-alone tablets to convertible notebook PCs with detachable tablets. Microsoft came out with its first convertible Surface tablet-notebook in October 2012. It is now on its fourth-generation Surface tablet. "Apple launched its first convertible tablet-notebook, the iPad Pro, on Nov. 11," he added. In reality, Microsoft is positioning Surface Pro as being more of a notebook than a tablet to justify its very high price compared with conventional PCs (a factor that also prices it out of the reach of most Windows PC buyers). Windows also only runs well on an Intel x86 processor, which necessitates that higher price and thicker enclosure, making for a poor tablet. The initial plan for Surface--to be more like an iPad, using a less expensive, more power efficient ARM processor--completely flopped because Windows RT for ARM couldn't run most Windows software. So rather than inventing the future with a detachable tablet-laptop, Microsoft is just scrambling to shore up its legacy PC operating system currently being ravaged by waves of iOS devices and commodity Android products. IDC is just carrying water for the company in the form of product marketing portrayed as research. If Microsoft were a dictator, we'd call this propaganda. Remember when Microsoft invented the iPad? A side effect of recasting Microsoft's failures as a string of "Great Leader" successes is the denigration of the actual leader of the global market, suggesting that iPad is following Microsoft's trend setting brilliance of selling large tablets that are thick and too large to be carried around like an iPad, necessitating a notebook-like form factor. In reality, Apple started out selling the most popular tablet size to ever ship at a profit, then added the smaller iPad mini in 2012, which increased its sales volumes at the cost of lower margins. Last year, Apple introduced an even smaller "tablet" in the form of iPhone 6 Plus, which increased sales volumes dramatically at higher margins. 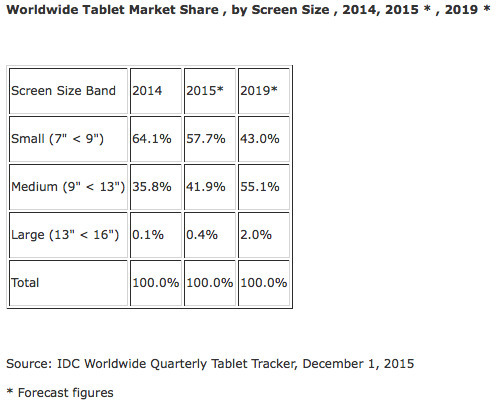 Note that IDC originally counted 5 inch or larger devices (like the Dell Streak) as "tablets." Apple is now selling a larger iPad Pro, not because Microsoft showed how successful a big tablet-laptop could be, but because the technology required to deliver a 12.9 inch iPad is just now becoming feasible. The newest Surface Pro 4 is about 10 percent heavier and 22 percent thicker than iPad Pro, despite Microsoft's hybrid contraption having a smaller display with a half million fewer pixels, a shorter battery life and a higher entry price. The base install of Windows on Surface Pro also takes up about twice the storage of iOS on an iPad Pro (roughly 26GB versus about 14GB). Note that Microsoft internally developed a small Surface Mini and drafted an original concept for a Courier handheld device, but was unable to successfully productize either one. In the decade prior to iPads, Microsoft struggled to find markets for Tablet PCs and UltraMobile PCs, a decade after Apple introduced Newton MessagePads tethered to a stylus and keyboard. This reality, combined with the real world sales volumes of today's Surface, makes it a bit disingenuous to suggest that Microsoft is in any way leading the tablet or notebook markets. It has simply failed in its many attempts to copy Apple's tablet devices. iPad Pro is a large iPad, not a "convertible tablet-notebook"
Despite being larger than Apple's previous iPads, there is no real difference in how the new iPad Pro is marketed, the software it runs, or the way it is intended to be used. 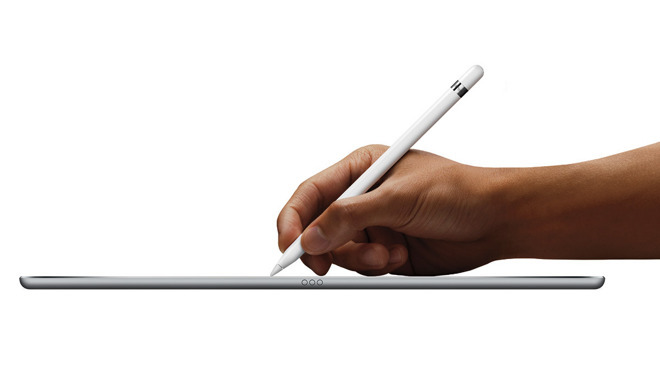 Apple doesn't present iPad Pro as being a "tablet-notebook." In the dozens of product photos of iPad Pro on Apple's promotional website, only one depicts it being used with an optional keyboard. Instead, it is presented as a larger, faster iPad with new support for a precision drawing tool and a new type of keyboard connector. Apple is also offering its own version of the keyboard-covers sold by third party iPad accessory makers since the original iPad shipped in 2010. Like Seitz, IDC similarly described a "switch" occurring from tablets to "tablet-laptops," or as the firm calls them, "detachables," even though there is no real data showing an actual trend from iPad-like tablets to Surface-like devices. The most reliable data--SEC filings from Apple and Microsoft--show that all tablet sales have reached a plateau, and that Apple's is roughly ten times higher than Microsoft's and eroding significantly slower, both sequentially and over the previous year. This could all certainly change in the future, but IDC doesn't provide any real insight into why it might, or even how it possibly could. 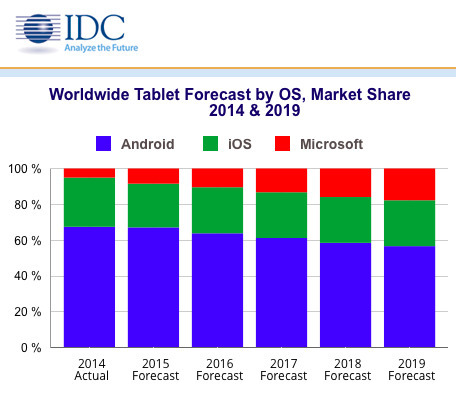 Also worthy of note is the fact that IDC's future fantasy doesn't claim that Microsoft's Surface will achieve 17.8 percent share of tablets by itself, but only when combined with all other Windows-based "slate tablets and 2-in-ones." Seitz, writing about IDC's forecast, conflated IDC's imagined future share for "Microsoft" tablets with that of the Surface specifically, a claim not even IDC was willing to make. IDC's vision for the future of tablet computing being led by Microsoft is eerily reminiscent of the same firm's prediction in early 2011 that Windows Phone would rapidly outpace iPhones in four years. IDC specifically "reported" that Windows Phone would similarly grow from single digits to over 20 percent share, while Apple's share of the global smartphone market would remain stagnant. While laughable in hindsight, there was at least some credible nugget of plausibility in IDC's 2011 figures, which essentially transferred most of the market share held by Nokia's Symbian operating system to Microsoft's Windows Phone, given that Microsoft was paying Nokia billions of dollars to abandon Symbian for Windows. Microsoft subsequently acquired Nokia outright, but currently has less share than it did in 2011. A year later, IDC repeated its prediction that Microsoft would surpass Apple in smartphone market share over the next four years, despite the fact that Microsoft's share had gone down while Apple's had gone up significantly. According to IDC's own figures, iOS had grown by nearly 5 percentage points in just one year, nearly as much as the total share of Windows Phone! IDC was also spectacularly wrong about the direction of BlackBerry and of Android over the course of just one year, making the firm's detailed "analysis" of four years into the future nothing short of a joke. It's hard to predict the future, and particularly so in the technology sector. However, IDC hasn't only been wrong about its far-off future predictions. It appears to have specifically crafted "data" to obscure obvious realities of the present. When iPad first began selling in large volumes, it was clear it would have some impact on PCs. Sales of netbooks collapsed first, followed by global PC sales growth grinding to a halt and then sliding backward. iPad wasn't the only factor, but the fact that Apple was pulling tens of billion dollars out of the market every quarter--and accounted for 80-90 percent of the tablets used by businesses--makes it clear that virtually every iPad sold eliminated the need for a conventional PC notebook--millions of them every quarter. Rather than predicting or even simply observing this trend, IDC (along with Gartner, another research firm that largely exists to serve Microsoft) invented a new silo it called "media tablets," with the express intent to segregate iPads from any direct comparison with PCs. Up to that point, IDC had historically counted Microsoft Tablet PCs as PCs, along with servers and cash registers and every other non-personal PC that involved a Windows license--in order to make Apple's Macintosh market share (and any other PC rivals) appear insignificantly small. Supposedly, IDC found it troublesome that Apple's iPad (along with Android tablets) were not running a "desktop OS." That forced IDC to diminish the iPad by counting it among other "media tablets," which specifically included kids tablets and toys. However, despite an ever lower "market share" number for iPads being reported by IDC, Apple continued to be the only company making real money from tablets ($23 billion over the last year alone). Tablets, toys and personal televisions running some form of Android likely had some impact on iPad sales volumes, but despite a massive balloon in global sales (as reported by IDC), Apple kept selling more iPads at a profit, in stark contrast to the obviously negative impact that iPads had on conventional PCs. This makes it particularly noteworthy that IDC consistently portrayed iPads as troubled while depicting PCs as being on the perpetual verge of rebound as soon as the next version of Windows would ship. However, iPads didn't begin to decline due to competition from a new surge in Android competition. Android tablet sales volumes have declined in parallel, and have suffered a larger, faster drop than iPads despite much lower prices. If anything, it appears that Android serves as training wheels for iOS, both among smartphones and in tablets: first time buyers get Android devices, then switch to iPhones or iPads, as shown in the much higher switcher rates from Android to iOS, the much higher "aspirational" brand value of iOS and higher satisfaction rates in iOS. 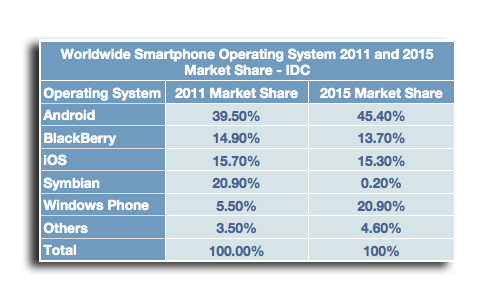 Notably, IDC didn't predict any potential benefit to iOS from Android. Instead, it regularly described Android as a low cost, high volume threat to Apple's "market share," a metric that in hindsight has clearly not mattered to app developers, enterprise buyers, e-commerce retailers and anyone else with a commercial interest in the outcome of computing platforms' success or failure. Additionally, now that Windows PCs overall aren't growing, IDC is recategorizing a segment of PCs that it does hope will grow (those "detachables," i.e. the product Microsoft is trying to sell) in a new bucket that mixes "media tablets" with tablets running Windows. That's a complete departure from IDC's previous explanation that media tablets don't run a "desktop OS" and are therefore totally different and must be segregated. Surface (along with other, similar products running Windows) are currently selling in such small volumes that any growth at all will deliver a big percentage of increase. This is the same marketing strategy that predictions for Zune and Windows Phone hoped to rely upon: exaggerating the significance of a very small volume increase against a much larger competitor by calling their difference in percentages of growth evidence of a "trend."